Are you serious about your oral hygiene? 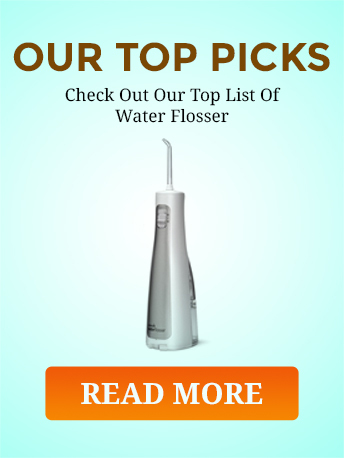 Do you know that water flossers are much more effective than traditional string dental floss? Well, now you do, and that’s the reason why so many people have been ditching the floss for a water flosser. You can get healthier teeth and gums by using one for just a couple of minutes per day, and you don’t have to suffer through all the blood and rough treatment the string floss gave you. I recently went on a quest to find out which water flossers available for sale on the internet were the best. Waterpik is synonymous with water flossers since they introduced the product back in 1962. This new cordless version is a great option for many of us who don’t want to spend a lot of money. What exactly powers this cordless water jetting marvel? Waterpik chose to keep it simple with the WF-03, probably to keep it affordable. This water flosser uses 3 AA batteries for its power supply, and they are included in the package. You never have to worry about plugging this flosser in or having the right adapters when you travel. When the pressure drops, you simply replace the batteries. This water flosser is completely waterproof for your convenience. If you’re like me, you like to brush your teeth in the shower, and now we can floss while we’re in there, too! Also, since it’s waterproof you can run it under some warm water to quickly and easily clean the unit when it gets some crud on it. Waterproof is definitely the way to go. When you buy the Waterpik WF-03, you get more than just a water flosser in the box. It also comes with three water flossing tips so other family members can use it, and a handy travel bag to keep everything in and all together. It’s these little details that remind you why Waterpik is the clear leader in the water flosser industry. This is a well made and affordable cordless water flosser. This water flosser from ToiletTree Products has a high capacity tank. That means you can use it longer between refills. For all oral care needs and individual preferences, there are three different water jet settings on this flosser. The first one is Normal, which is a good medium jet of water that most people are able to use. The second setting is Soft, which is a lower pressure setting that’s ideal for those with sensitive teeth or gums. The last one is Pulse. Pulse is a high-pressure setting that is used to blast out those stubborn food particles from between your teeth, so be careful! One of the best features of this water flosser is that it works anywhere in the world! No matter where you find yourself, this flosser can be recharged with a wall socket. From 100 volts up to 240 volts, either 50 or 60 hertz, just plug this charger into the wall and your flosser will be ready to use in the morning. There are some rather strange wall sockets overseas, so you still might need to locate an adaptor, but rest assured that this machine will work just fine. Any product you put in your mouth to improve your health should be safe. This product definitely is. It is certified BPA-free and FDA approved for your health and safety, so you don’t need to worry about any long-term health effects from using this product down the road. The Poseidon Oral Irrigator is another quality product brought to us by ToiletTree Products. You’ll love the sleek and compact design. The Poseidon Oral Irrigator runs on lithium ion batteries that can be recharged indefinitely. To accomplish this task, a charging cradle is included with this water flosser. You simply plug the cradle into a standard wall outlet, and store your Poseidon on the base when not in use to ensure a full charge. It’ll always be ready for use! Buying every member of your family their own water flosser would be a gigantic waste of money and counter space. With the Poseidon, all of your family members can share this quality dental tool. To get you started, three color-coded and interchangeable tips are included, and you can buy more online if you need them. This is a great tool that the whole family will love to use. If you’re worried about being satisfied with this purchase, don’t be. ToiletTree Products wants to make sure that everyone is happy with their new water flosser. To accomplish this, they guarantee your satisfaction 100%, and back up their product quality with a nice one-year warranty to the original purchaser. If you do have any issues with your Poseidon water flosser, their super customer service is available Monday thru Friday from 9am-5pm Eastern time. You don’t need to worry about being disappointed with this purchase. This water flosser from SmarToiletries has tons of features that made it a top contender. Plus, you’re really going to like the price. It can be a pain to have to keep refilling your water flosser while you clean your mouth. To help with this, SmarToiletries outfitted this flosser with a large capacity tank. It’s super easy to fill up with a simple flip-open cap, and you get around 45 seconds worth or high power water jet with each tank! That’s just about right to do all your top teeth, then you can refill and do the bottom. A bigger tank is better for a cordless water flosser, and that’s what you get here. This water flosser doesn’t disappoint when it comes to performance. It puts out a staggering 90 psi on the highest setting, and a whopping 1400 pulses per minute when it’s on Pulse mode. Of course, you can always use a lower setting if the pressure hurts your teeth or gums. If you’re worried that this water flosser doesn’t have the power to remove all the debris from between your teeth, don’t be. This baby is a high performance machine. To handle the power duties, this water flosser contains lithium ion batteries for more power and longer battery life. These batteries are fully rechargeable, so you don’t have to worry about buying any. Charging can be done from any USB source, or you can use the included AC adapter to plug into any standard wall outlet. Just plug it in when you’re done, and your water flosser will always be fully charged. This unique water flosser from Panasonic has a space-saving design. You’ll love how easy this water flosser is to use. This Panasonic water flosser features two separate pulse rates to clean effectively for people with braces, veneers, bridges, crowns and implants. The two rates are high speed, which is 1,400 pulses per minute, and a lower 1,000 pulses per minute setting. High speed is a normal setting for most people, while the lower setting is great for kids or people with sensitivity issues. Anyone can clean their teeth without fear of pain with this water flosser. This water flosser features a unique collapsible design. To stow it, you simply push the power head down into the reservoir, which reduces the total volume required for the device by about half. To use, you simply pull the power head out of the tank and it’s ready to use. This flosser features a large 5.5 ounce reservoir, which will give you more flossing time between refills. Filling the reservoir is easy using the flip-open cap. To make cleaning and maintenance easy, and also so you can use it in the shower, Panasonic made every part of this water flosser 100% waterproof. Fearlessly floss your teeth in the shower or out in the rain, because water won’t hurt this flosser. To clean, rinse with warm water and wipe down with a clean dry cloth. Taking care of this water flosser couldn’t be any easier. If a cordless water flosser is a product your household could use, all five of these products are quality choices. However, every time I research a group of products I always feel the need to select a winner. For the Best Cordless Water Flosser, my winner is the SmarToiletries Professional Cordless Oral Irrigator. It has comparable features to all of the other flossers including the more expensive ones, and I like that you get four total tips in the box when you receive it. The charging system is also excellent, with the versatility to use a wall socket or any USB power supply. For best overall value, the SmarToiletries Oral Irrigator can’t be beat. It should be first on my Best Cordless Water Flosser list and i hope you will agree with me!